The region now occupied by the Sierra Nevada Mountains once lay beneath the sea, receiving sediment from the North American continent to the east. Through the process of plate tectonics, the Pacific Plate crashed into the North American Plate and was subducted beneath it. The incredible force of the crash caused the sediment to melt, forming an enormous magma chamber which eventually cooled to form granite. These forces additionally caused the uplift of the land, forming enormous mountains. The process of erosion has since removed the sediment layer above the granite, exposing the sierra that we see today. Continuous movement of the plates caused additional uplift, melting and folding that produced a mix of sedimentary, metamorphic and volcanic rock that can be seen today. About 30 million years ago, an era of volcanism of massive proportions began in the sierras. During this era, the sierra began uplifting again to form many parallel faults. The area to the west rose while the area to the east (now Carson Valley) dropped. 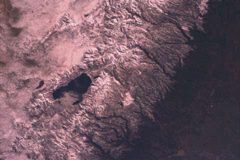 The Tahoe Basin, like Carson Valley, has dropped between two uplifted blocks; the Sierra Crest on the west and the Carson Range on the east. Volcanic activity occurred frequently just north of the lake, and a lava flow eventually crossed over the Carson River. This dammed the valled and formed Lake Tahoe. 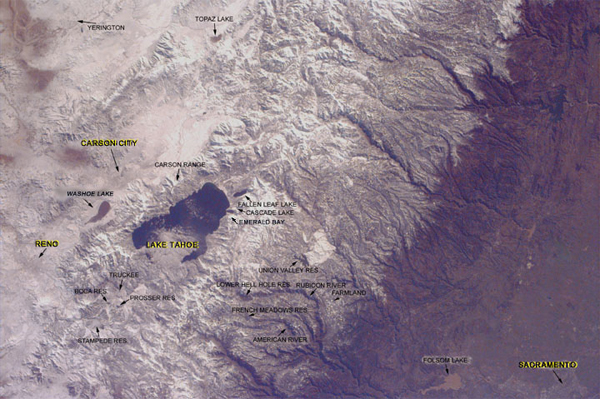 The area to the east of the range is referred to as the high desert. At elevations ranging from four to six thousand feet, this flatland receives very little rain because the peaks of the Sierra Nevada block precipitation flowing from the west (the ocean). Although this area is desert, it still remains very cold in the winter, and snow frequently covers the area. The area to the west of the range is California's central valley, the primary home of the state's agriculture. However, in this picture, one of California's most important cities is also visible-Sacramento. Lake Tahoe sits in a deep valley at an elevation of 6,229 feet. At a maximum depth of 1,645 feet, and an average depth of about 1,000 feet, it is the third deepest lake in North America, and the tenth deepest in the world. The lake holds over 39 trillion gallons of water, enough to cover a flat area the size of California to a depth of 14 inches. With only one river outlet, the lake maintains its level mostly by evaporation. If the amount of water evaporated from the lake over one year could be captured, it could supply the daily requirements of a city the size of Los Angeles for five years. In the winter, the lake does not freeze because of the large volume of water that constantly circulates and causes old surface water to sink, while warm water rises from below. 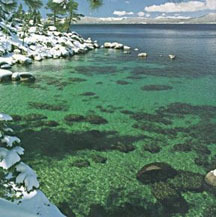 It is no wonder that the name "Tahoe" is derived from the Indian word meaning "big water." A view of the bottom. The crystal blue lake is so clear in areas that objects can be seen to depths of 75 feet. The clarity in the water comes from the fact that 40% of the lake's water intake comes directly from rain. Additionally, the water that is channeled in from streams undergoes a natural filtration process. Here, the water's path through marshes and meadows removes most of the dirt and sediment to preserve the clarity of the water. The lake is so blue because the thin, clear mountain air allows the lake's pure, crystaline water to reflect the blue sky above. Carson City was founded as a community in 1858 and named for the nearby Carson River which was named after the famous frontiersman Christopher "Kit" Carson. Pioneer Abraham Curry surveyed the land and planted a townsite while also setting aside 10 acres specifically for the erection of a capitol. President Abraham Lincoln recognized the importance of Nevada's silver and gold to the Union's Civil War efforts, and proclaimed Nevada a state in 1864, making Carson City the capitol. Gold and silver mining remained a prosperous activity in Carson City for many years. 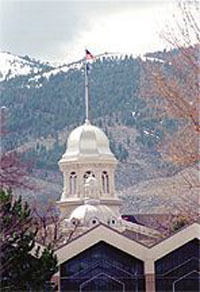 The United States Mint in Carson City was built in 1869, and today it is the site of a museum. When the metal mining grew thin, timber mills kept the economy going. Today, the city is located conveniently close to Lake Tahoe and Reno, allowing the city to maintain a thriving commerce from tourism. An American settlement of Reno began in 1859 when a toll bridge was constructed over the Truckee River to aide pioneers on their way to California. The area became known as Lake's Crossing, and hundreds of pioneers discovered its promise of a better life. The discovery of silver fulfilled that promise. Silver from the rich Comstock Lode helped finance the Union's efforts in the Civil War and gave Nevada the nickname of the "Battle Born" state. In fact, the city of Reno was named after the Civil War hero, General Jesse Reno. Silver and the railroads turned Reno into a booming town. In 1927, the transcontinental highway system came to town. In celebration, the town erected an arch across Virginia Street, welcoming visitors to "The Biggest Little City in the World." The idea stuck. Today, the fourth generation of the famous Reno Arch greets the millions of visitors who flock to the city each year. Hit hard by the Great Depression, Nevada took a chance in 1931 and became the first state to legalize gaming. It was a gamble that would pay off big for the growing town of Reno. The Truckee River allows those who do not wish to gamble the opportunity to still enjoy themselves. Carrying Lake Tahoe's crystal clear waters, the river meanders its way through the town, offering rafting and a good peek at wildlife within mere feet of ringing slot machines. Geese and ducks can easily be seen bobbing along the gentle rapids. The city over the Sacramento River. Sacramento is built in a flood plain near the Sacramento and American rivers. These rivers have always played an important part in the city's history and economic success. Unfortunately, the rivers have also brought floods. Today, the city is protected by a complex system of dams, levees and bypasses, but flooding remains a significant problem. Just 200 years ago the Sacramento area was very much alive with Miwok, Maidu and Shonomy Indians. In the mid 1800's, the Spanish explorer Gabriel Moraga named the area Sacramento, meaning "Holy Sacrament." Soon after, European settlers began to invade the lifestyles of the native American population. In 1848, a discovery at Sutter's Fort (which is about 50 miles from the current downtown) changed the Sacramento frontier forever. Gold was found by a contractor at John Augustus Sutter's lumber mill. Sutter tried to keep the discovery secret, but the news soon spread to San Francisco, and the gold rush was on. 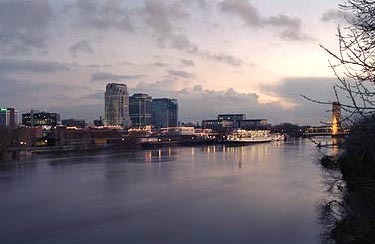 By 1850, Sacramento had a population of 9,000, and was an important city in the growing west. California became a state in 1850, and by 1854 Sacramento was the state capitol. In 1860, Sacramento was designated the western terminus of the Pony Express. In 1863, the first track for the transcontinental railroad was built, which would link the east and west coasts. When the railroad was finally completed in 1869, the city began to grow and prosper.